It takes a good DJ who puts the songs of a producer to work and make a crowd go wild. To even top this both meet in studio first bevore they hit the stage. 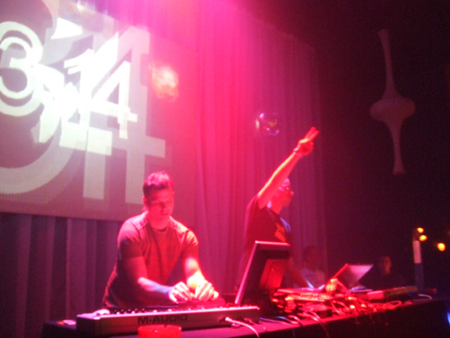 Performing and producing live on stage is the most powerful kind of electronic club music. That is exactly what Virtual Dialog does. Smilla has grown to a well known person in the urban night life of south Germany as he kept playing continuously for many years now, regularly with DJs on the scale of Adam Beyer, Pascal Feos or Jeff Mills. He meets B. Piltz a producer that unfolds his creativity within uncountable projects reaching from HipHop to Techno always working with a high degree of perfection. The Studio of B.Piltz is the place where the songs are generated, both working on Computers that are syncronised to each other. These productions get presented to the audience the same way at last. So the originality of the songs remains the same. Bevore however the Songs are worked out and mixed in the studio to get the maximum out of them. Thats where the finalised mixes for CDs come out but also when recorded one step later during a live performance. Most characteristical for Virtual Dialog is their creativity and bravery for exceptional sound work. As they create their own loops and voice samples the songs get their very special note making it easy to stand out from the crowd. Virtual Dialog is working in this constellation since the middle of 2004. In the year 2006 B.Piltz and Smilla decided to present the first selection of tracks live to a small audience. Since that both enthuse a steadily growing public as they always rock the spot.